Originally I am from Yorkshire, England. I moved across the pond in 2000 to marry my hubby, who is American and now we live in Central Maine. I was the kid at school who always drew in every lesson and was the class artist. 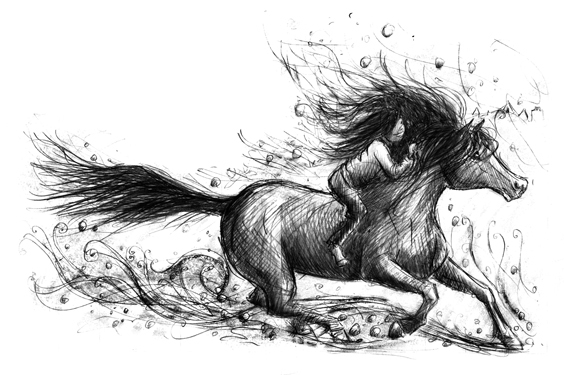 When I left school I wanted to work with horses, but my art teacher took me in hand and marched me to art school. Alas, I didn't settle in college and left after my second year. Back then children's illustration courses were unknown (I am talking about 1980's not the Dickens period here!). So I joined the Navy and had a great time learning how to get up every morning, march and how to be a graphic designer. 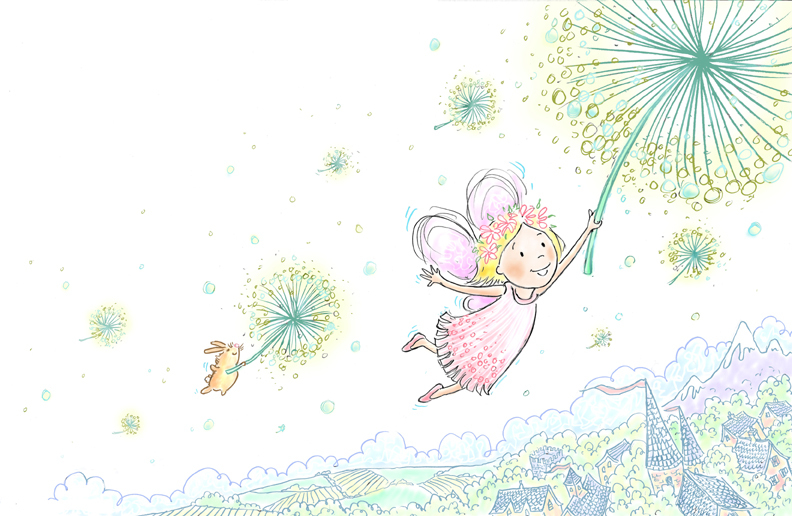 I worked in graphics and print until I moved to America, finally got my act together and began illustrating - first mostly commercial work, then I joined the SCBWI in 2009 and started to work in children's books. I've illustrated about 14 books, including 'How to Talk to an Autistic Kid' which one a gold medal from Foreword Reviews, '1,2,3 by the Sea' and 'Hidden New Jersey'. 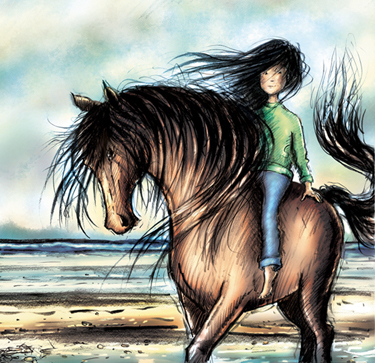 Clients include Charlesbridge, Highlights, Kane Miller, ABDO, Free Spirit. 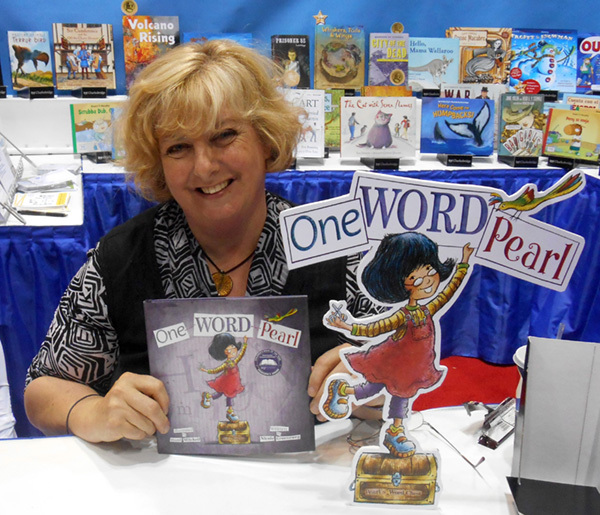 My next book is 'One Word Pearl' from Charlesbridge/Mackinac August 1. I think I'm pretty darn lucky! Q. How did you get started in illustration? I've always done some sort of illustration, even when I was in graphic design. Back then it was mostly commercial. I dreamed of illustrating for children, but I had no idea how to go about it. It took me a long time to find my way. 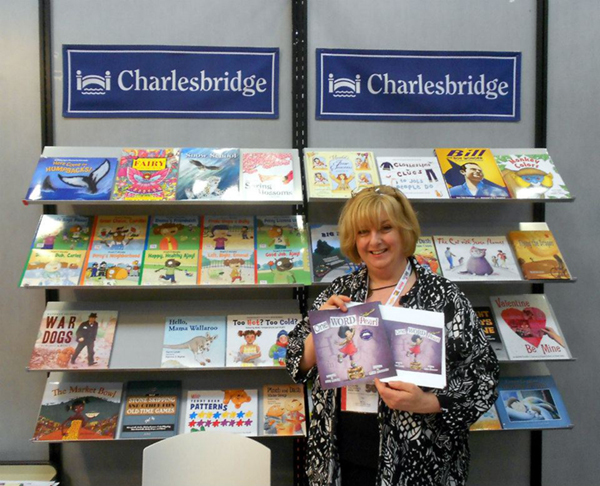 I started to do more work for children in about 2004, but not in trade books. I used to be totally intimidated going into a book store's children's department and would turn and leave, sweating and gibbering that I could never be good enough. But gradually I started to build a portfolio. 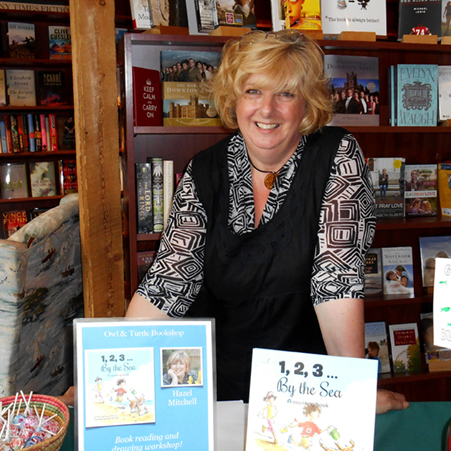 In 2009 I went to a writing workshop held by a local writer in Maine and Lisa Wheeler was the speaker for the day. Suddenly I realized that I could do this if I worked hard enough. Working hard has always been my ethos. In January 2010 I went to my first NYSCBWI Winter Conference, got giddy, learned a lot and immersed myself in learning the business. I went to every conference I could afford (and some I couldn't), started to build my portfolio online and off, and mail out to publishers. I got my first book in Oct. 2010 from a postcard mailer. Q. You have a great online presence. Do you have any methods or tips you'd like to share with other illustrators on maintaining that presence? It's been very important to me. But we all have different paths in this business, which is what makes it interesting. I am a great believer in the adage 'If they don't know you are there, they can't find you'. The internet was really starting to go nuts with Facebook and Twitter back then. People talked constantly about your 'platform'. So I thought I might as well have a go. Tip 1 ... make sure you have a good website. Mine has got better over the years, and that's your main online presence. Tip 2 ... if you hate social networking, don't do it. It's not mandatory! But if you are a social person (which I am) it can actually be enjoyable. Back in 2010 I started my blog and joined Facebook. (Believe it or not, I really was ambivalent about FB!!). 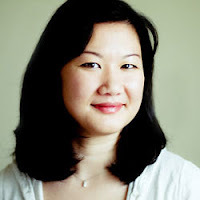 I blogged regularly about what I was doing and began to build an FB presence. Posting my drawings and doings was fun. Connecting with other illustrators was fun and also a great help. We work in an isolated environment, and I also live in a rural area. I learned so much from writers and illustrators on many levels from finding them on FB. 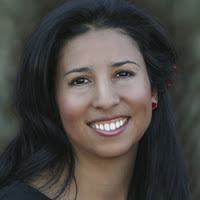 I also connected with industry professionals and have to say several of my books have come from those connections. Tip 3 ... talk to people who are kind enough to talk to you! It's rude not to. Tip 4 ... decide how much is enough for you. When it becomes a chore ... slow down. I used to do a lot more online than I do now. I hope that is because I am busier now! I use cross posting apps. FB is still my biggest platform, but I am on Twitter, LinkedIn, Google+, Pinterest, Tumblr. Often I don't post in those places more than once a week, if that. But I am still there and those posts come up in search engines. The more you are 'there' the more people can find out about you and your work. Q. Do you keep a sketchbook? I go through phases. I've never been the most ardent sketchbook keeper. 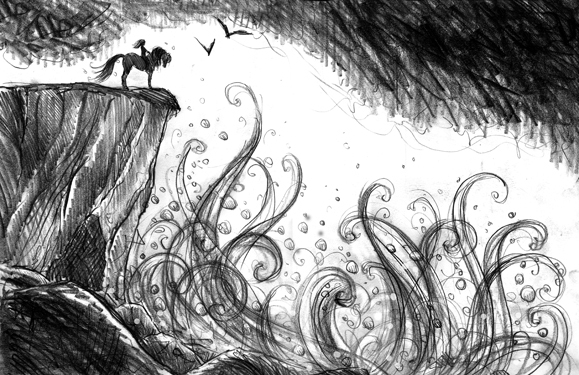 If I am working on a book I don't tend to sketch as much. I do keep one by the computer and in my bag. But I don't get it out as much as I should (note to self!). I tend to write in my sketchbooks too. When you go back and look through them even a small doodle can give you a great idea. Or a note in a margin. I hate website design! I keep thinking I should just change over to a blog and have the whole thing in one. But somehow it is never top of my list. An online portfolio is totally necessary. I like that my book pages on my website now are part of the whole thing as well as my gallery. I have more than one blog, as well as a Flickr stream and Pinterest. Sometimes I am really active posting! That's usually in between projects! My tumbler blog is mainly sketches as is the Flickr stream. My 'main' blog is usually news and events. I love posting on FB and sharing my work with people - and seeing other people's work! It's inspirational. I also have a project about my childhood where I post pictures I have drawn. I don't even care if anyone looks at them ... it's like keeping a diary. But one that I am happy to share with others. It might inspire them too. Often it can get me thinking again when I have lost energy. I don't worry about posting my stuff online. It's brought me a lot of great things and very few bad ones. I guess I am an eternal optimist. Q. What are your favorite tools? Well, I jump around. I am finding it depends on the project also. I love to work in pencil and also dipping pen. But I love watercolour and collage too. I love photoshop which I have used since the 80's. I do a lot of digital colouring. But I also use more textural stuff and hand painted stuff these days that I scan in and manipulate. I use an Intuos Wacom pad and couldn't live without it. I love my scanner too!! Q. Are there any exercises or experiments you do to keep your creative juices flowing? How do you get out of a rut? Sometimes, you know, ruts are required. When you are in the biggest rut, kicking yourself out of it can give you the best ideas. I think we need the lows and highs. It's part of the creative process. I used to try to force it when I was in a funk. Now I try to give myself breathing space. Music helps. Cleaning the house helps. Letting my brain do something mindless. Doodling ... doing something that is not required. I love Lynda Barry's books 'What it is' and 'Picture This'. Just the act of putting a pencil on paper can kickstart you. The trouble with my mind is, it seems to have too many ideas and then I overload and do nothing. At times I have started the morning with a daily sketch which I still enjoy, but I don't do as much now (note to self!). 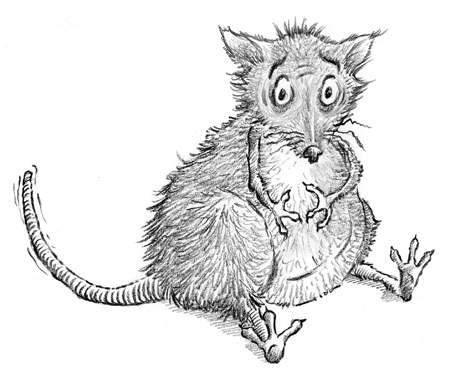 So many illustrators have said to me that experimentation is the way back from a dry period or burned out phase. And I think they are right. Oh, and always TEA. And a nice kilted man ;-), although they are hard to find. Q. Would you mind giving us a peek at your workspace? Sure, I work on the second floor (or first if you are English) in an L shaped room. 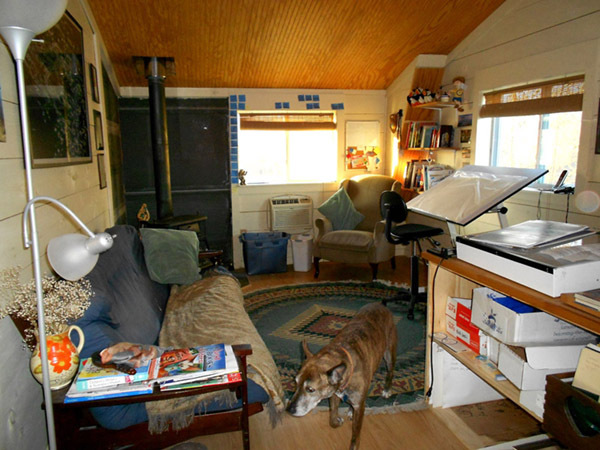 It has nice windows and a wood stove and some comfy chairs. There is always a dog around. Throughout the months I stick things on my wall ... postcards from people, photos, thank you cards, conference badges, drawings, notes. They kind of sink in for a while. And then, usually when I am about to start a project, it all comes down and I start clean for the next period. I also have a worry stone that I picked up from my first conference in LASCBWI and I turn it when I am working. It's like all my wishes are poured into it. 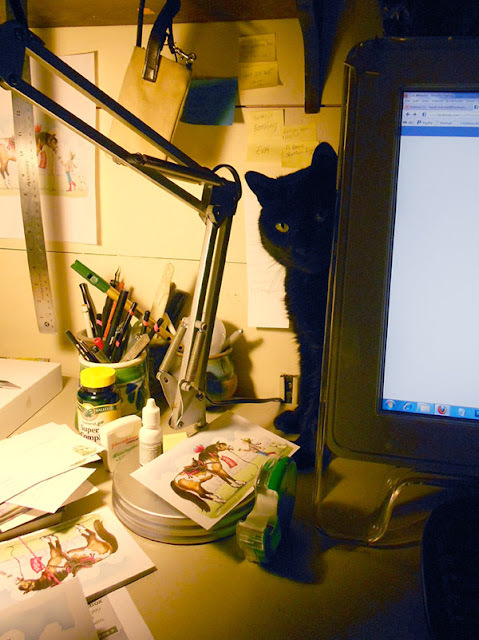 I also have a small purple, chinese cat stuck to the top of my screen which is for artistic luck. I have good intentions to leave the studio and go and work somewhere like the library or a museum or coffee shops. 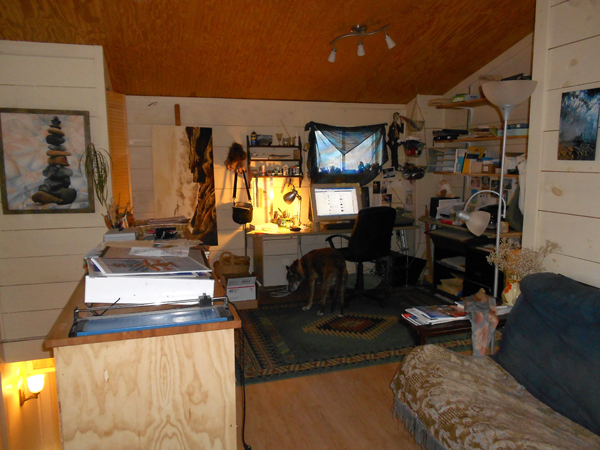 But it seems I like to be in my studio. I think Hazel's personal art director likes her being in the studio, too! Q. What is an unexpected thing you've learned in your career? Image from 'One Word Pearl'. Q. 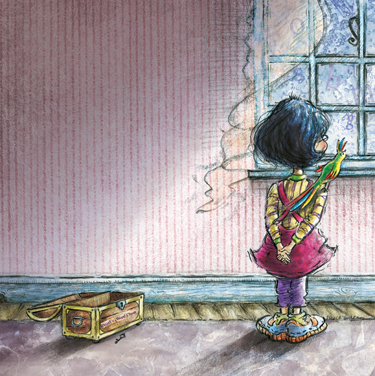 What's the most fun thing about being an illustrator? Getting to create all day. Meeting kids who like your work. Inspiring other people. Seeing your work in a bookstore or library. Not driving to work. Looking like a slob all day if you feel like it and getting paid for it. 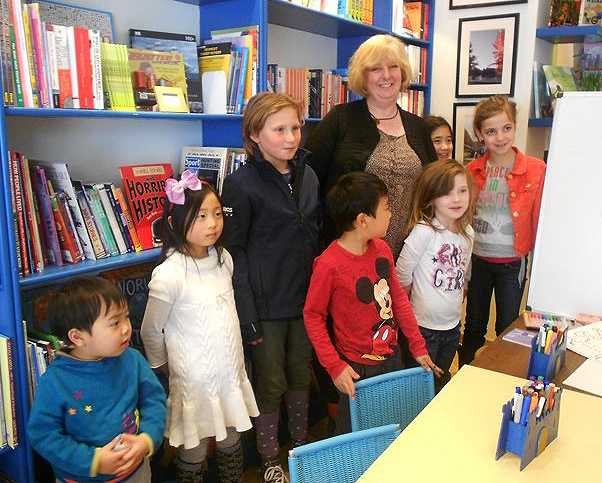 Hazel with fans at Treasure Trove Books! Q. Do you have any upcoming projects or news you're excited about and would like to share? Yes please! 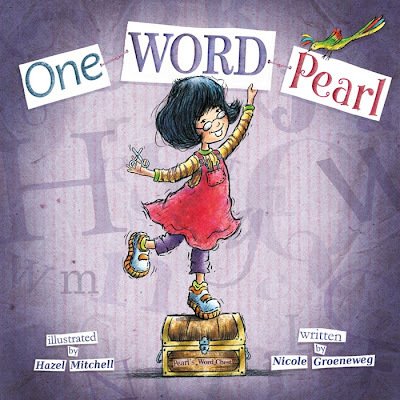 My new book 'One Word Pearl' by Nicole Groeneweg is out on August 1 from Charlesbridge/Mackinac. I got to use a lot of new techniques in this book and I am excited about that. 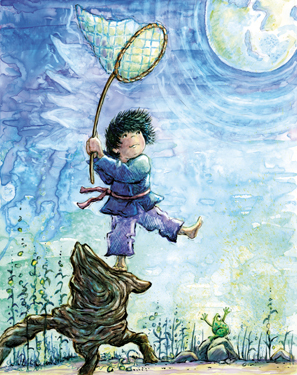 I will also be part of the faculty at NESCBWI Illustrator's Symposium in November 2013 in Manchester in NH and I am jazzed about that too! Thank you so much for spending some time with us, Hazel! Happy book birthday to 'One Word Pearl', officially out in the wild! 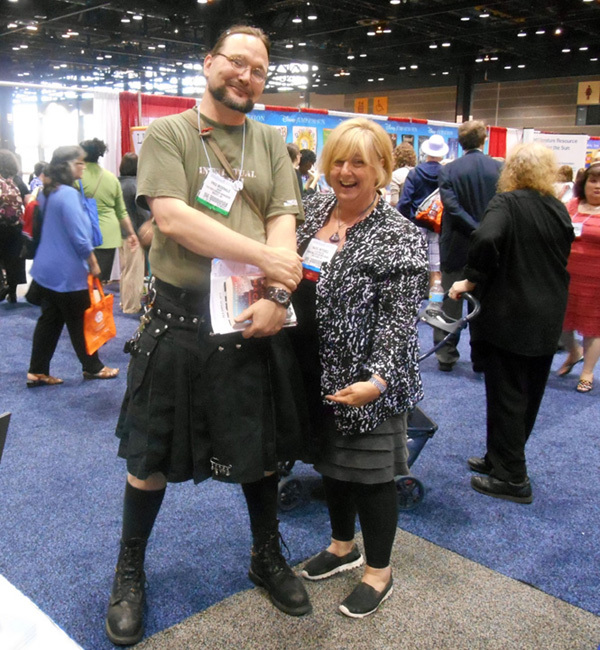 If you haven't met Hazel in person yet, do look for her at conferences and book festivals - she is an absolute delight to be around and gets entire crowds laughing. There's no better quality than that! It's been really fun having a few fellow bloggers join us on Simply Messing About. Both Debbie Ridpath Ohi and Hazel Mitchell are part of another fantastic group blog called Pixel Shavings. I highly recommend poking around their site! In other news, the Simply Messing About team has been so busy with work and conference prep. 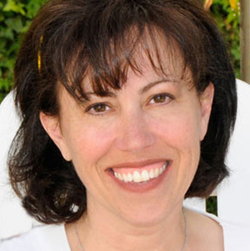 Three of us are currently attending the LA SCBWI conference this weekend! Look for Christina, Laura, and Tracy and say hello!